We have a thrilling piece of news to share: Piwik PRO is teaming up with Tableau to make interactive visualizations of data and create custom reports for faster decision-making processes. Tableau is a leader in the data discovery field appreciated for its complex data visualizations and interactive dashboards. 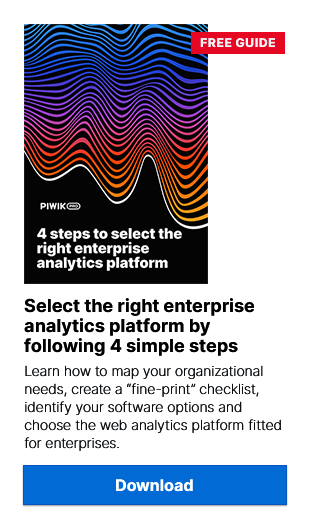 The integration with the Piwik PRO Analytics Suite will enrich the functionalities of both tools by pairing business intelligence with a top-quality data collecting platform. All this will come available with flexible deployment options for both on-premises and cloud infrastructures. Any business operating within a digital ecosystem recognizes the significance of measuring and analyzing user behaviors. Acquiring insights into visitors’ interactions with your site is indispensable to meeting your business objectives. This calls for world-class tailored data analysis tools. The Tableau platform provides users with software that enables them to query and analyze data, then generate rich business insights in an easy-to-consume format. Its integration with the Piwik PRO Analytics Suite will help you collect data efficiently while ensuring full compliance with the most rigid data privacy laws around the globe, including GDPR. Both companies are dedicated to helping customers meet their goals and allowing users to act freely. Thanks to backend flexibility, reports are created in Tableau with minimal effort. So if you use Piwik PRO data in Tableau, you can freely select tables for your analyses and explore data without being limited to chart types, and choose your preferred dimensions to prepare reports tailored to your needs. In addition, creating visualizations and diving into data allows business users to perform in-depth analyses without extensive technical expertise. What’s more, you can customize the look and feel of the dashboard layout in a simple and intuitive drag-and-drop manner. It’s no secret that for marketers time is crucial. Giving Tableau access to Piwik PRO ensures your valuable resources won’t be wasted. First, you can instantly acquire real-time reports without waiting for data to be aggregated. Next, you can extract data to save it to your local hard drive. Thanks to this capability you don’t need to query the database with every change you introduce, so you don’t waste any time waiting. This is especially helpful if you’re forced to work offline – for instance, if your internet connection breaks down or while you’re on an airplane. optimize server performance to avoid overloading. apply basic metrics which are already at your disposal along with the integration in order to save time and acquire a broad understanding of your site’s performance. Finally, connecting Tableau to Piwik PRO gives you the possibility of applying aliases. Whether for data protection requirements or simply your convenience, you might need to save data using abbreviations then create a table of aliases to make reports for your organization clear and logical. Also, aliases let you translate previously hashed data in Tableau. Needless to say, these two efficient tools have already earned recognition, and this tandem will represent a substantial advancement in your digital set-up. Hopefully our description of the integration’s key features have given you the whole picture now. Want to have a go with Piwik PRO and Tableau? If you’re ready to extend the capabilities of Piwik PRO with custom reporting, effective interactive dashboards and an intuitive interface, reach out to us to get your hands on the Piwik PRO Analytics Suite integrated with Tableau.